Anyone can benefit from taking Sun Chlorella, from children to seniors. Our body is exposed to toxins every day in one form or another either in the foods we eat, the water we drink, or even in the air we breathe. These toxins can damage our body`s natural defence system and cause health problems. As the body ages, it struggles to eliminate toxins. Toxins accumulate in the body and are then excreted into the intestinal tract where most of it gets reabsorbed. Sun Chlorella is grown in the South of Taiwan. Sun Chlorella `A` is a high quality and balanced nutritional food supplement rich in various nutrients. Sun Chlorella `A` contains nutrients such as essential amino acids, vitamins, chlorophyll that are known to be essential for a healthy body. Because Chlorella pyrenoidosa (Sun Chorella strain) that is cultivated outdoors is used, this chlorella extract contains a larger amount of Chlorella Growth Factor (C.G.F.) than any other chlorella species. This unique and patented technology succeeds in breaking down the cell walls by 95%, thereby solving the only remaining problem of tough cell walls that hindered digestion and absorption. Hence this product is sure to satisfy not only first-time users, but also those who experienced dissatisfaction with conventional chlorella products or other health foods. “Chlorella, a single-celled, micro-algae, is one of the most powerful natural detoxification tools you can use to help eliminate accumulated toxins, in your body. Not all products are alike. The key to chlorella`s detoxing abilities lies within its membrane, but the fibrous cell wall of chlorella is actually indigestible to humans. To optimise digestibility it is essential you only use products like Sun Chlorella where the cell wall has been effectively broken down during the manufacturing process. Pulverised Chlorella (95.5%), Soy lecithin (from non GMO soya beans). 1 Sachet per day. May be taken all at once or in smaller amounts if desired. Can be taken in a drink such as water, juice or mixed into a smoothie. Can also be added to foods such as porridge and yoghurt as well as sprinkled over salads. Keep out of reach of young children and store away from direct sun light and heat. Below are reviews of Sun Chlorella A Granules - 20 x 3g Sachets by bodykind customers. If you have tried this product we'd love to hear what you think so please leave a review. 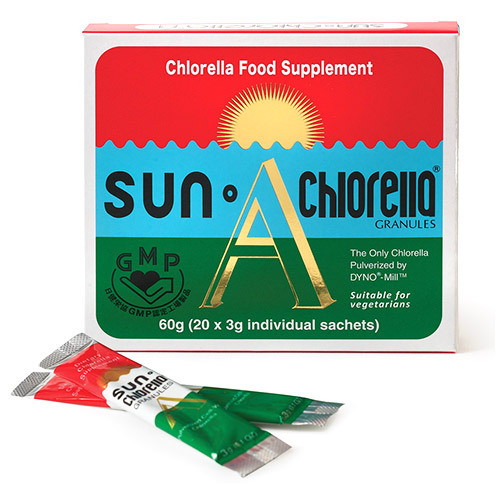 Sun Chlorella A Granules is a high quality and balanced nutritional food supplement rich in various nutrients such as essential amino acids, vitamins, chlorophyll. that are known to be essential for a healthy body. Contains 20 handy sachets.